As El Salvador struggles with widespread violence and a sluggish economy, polls from San Salvador appear to show President Mauricio Funes’s approval ratings plummeting—from 83% last March to 41% in June. But on a recent visit to San José Las Flores, deep in the mountains of Chalatenango, members of the Cambridge, MA Sister City delegation were impressed by the strong support Funes continues to receive in the countryside, and the visible accomplishments of the government’s new social and economic initiatives. For starters, the road that brought us from Chalatenango into the community is being completely repaved, Credit: Jim Campen at a cost of $7.5 million. This is part of a major public works “stimulus” program launched by the government to help counter the effects of the recession. The road construction has created jobs for an estimated 650 workers in and around Las Flores, many of whom crowd into the comedor daily for the noontime meal, providing a boost to the local economy. The government’s new health program, which features a system of community-based family healthcare teams (ECOS), gets high marks from local residents. In rural communities like Las Flores, the team is designed to include a doctor, nurse, nursing assistant, general assistant, and three health promoters for every 600 families, supported by a network of specialists. 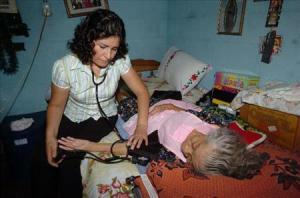 Their focus is on preventive, family- and community-oriented health care, including nutrition, sanitation, and housing. There are now 410 ECOS in 141 of the country’s 262 municipalities, including 57 in Chalatenango, where only 3 of 33 municipalities have yet to benefit from the program. ECOS, Guarjila. Credit: EDH/ Jorge Reyes. Las Flores is one of several communities in Chalatenango that recently received its own ambulance. A presidential decree has also eliminated the “voluntary payments” charged to patients for hospital care, which generated $12 million annually in revenues for previous governments. Nevertheless, according to Viceminister of Health Violeta Menjívar, the Funes administration has managed to double the government’s investment in health care, at a time of severe economic crisis. At the local elementary school in Las Flores, principal Nelson Orellana described the many new projects made possible by government support, including a newly-constructed preschool with handicap access. A computer lab and a science lab are in the works. Especially important, he says, are the government programs providing free nutritious meals, uniforms, shoes, and school supplies for every student. This not only benefits 1.4 million Salvadoran schoolchildren, but creates jobs School uniforms, Las Flores. Credit: Jim Campen for the small producers and cooperatives that are contracted locally by each municipality to provide the clothing and supplies. As Tim’s El Salvador Blog notes, this is in effect another stimulus program, addressing problems of poverty, school dropouts, unemployment, and the economic crisis simultaneously. The government’s Family Agriculture Plan, which distributes free seeds, fertilizer, technical assistance, and low-cost credit to small family farmers and cooperatives, is also popular in Las Flores, a strong farming community. Reversing a legacy of agricultural stagnation imposed by conservative governments that encouraged dependency on food imports, Funes wants to make the countryside the “new engine” of the country’s economic growth. The government’s goal is to achieve “food sovereignty,” self-determination of the country’s own agricultural policies, as well as “food security,” sufficient safe and nutritious food for the entire population. By 2014, the hope is that all corn and bean seeds will be produced by Salvadoran farmers, instead of being purchased from multinational corporations. In past years, most seeds (including those in government distribution packets) have been purchased from a transnational company founded by conservative ex-president Alfredo Cristiani, which is now a subsidiary of Monsanto. With respect to corn seeds, the program has been so successful that the goal is expected to be achieved ahead of schedule, in 2012. Credit: SHARE Foundation. The government is collaborating with three large farming cooperatives in a pilot project to produce conventional corn seed on a massive scale. National agricultural production is expected to grow by 25% this year. To be sure, the government’s new programs are not immune from criticism in Las Flores. The ECOS need better equipment, residents say, and medicine—mostly imported from the United States—is the most expensive in Latin America. The national illiteracy rate remains high, around 17%. 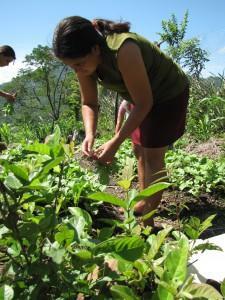 Campesino groups in El Salvador have criticized the government’s failure to promote sustainable agriculture through its seed production plan, urging that organic native seeds be substituted for conventional hybrid seeds with their associated chemical inputs. Despite these shortcomings, says Nelson Orellana, “The Funes government has a vision, and has accomplished more in two years than the conservative ARENA government managed to do in 20 years.” In the context of a world economic crisis, continued U.S. dependency, and ongoing political divisions and domestic social challenges, this is no small achievement.